Para o pessoal interessado nas teorias do turismo. 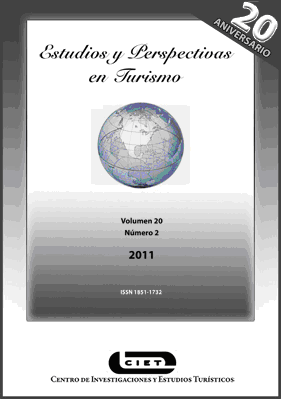 Acaba de ser publicado na revista ESTUDIOS Y PERSPECTIVAS EN TURISMO (Volumen 20 - Año 2011, n. 2, Marzo, p.384-403) o artigo Implicaciones epistemológicas en la investigación turística, escrito pelo prof. Dr. Marcelino Castillo Nechar (Toluca, México) e por mim. O site da revista é: http://www.estudiosenturismo.com.ar/ - acesso gratuito. Há duas versões do artigo, em espanhol e em português. Epistemological implications in tourism research. The article presents a reflection of the epistemological implications of tourism research with the aim of creating and producing knowledge of tourism, among which the opposition is often commonly made between theory and practice, science and scientific criticism and interpretation, decanting theoretical and methodological objectified processes (positivist), due to the hegemony and argumentative burden of modern science. In the case of tourism, specifically discusses what has been the construction of knowledge through a short scene showing their orientations and biases, both worldwide and in Mexico and Brazil, noting the lack of critical research, highlighting the importance of higher education institutions (HEIs) and the challenge involved gestate the conditions for a thought-reflective and critical research in universities and research studying tourism. This discussion takes a critical perspective as a framework that combines the philosophical and pragmatic analysis of the objects in question. KEY WORDS: epistemology, criticism, science, research, tourism.